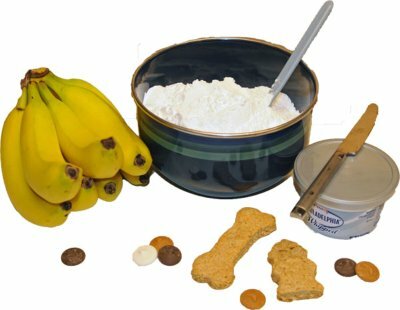 We will reveal the secrets of dog treat icing so that you can being to make beautiful dog treats that look like they were made by a professional dog bakery! If you promise not to tell, we will share them with you. 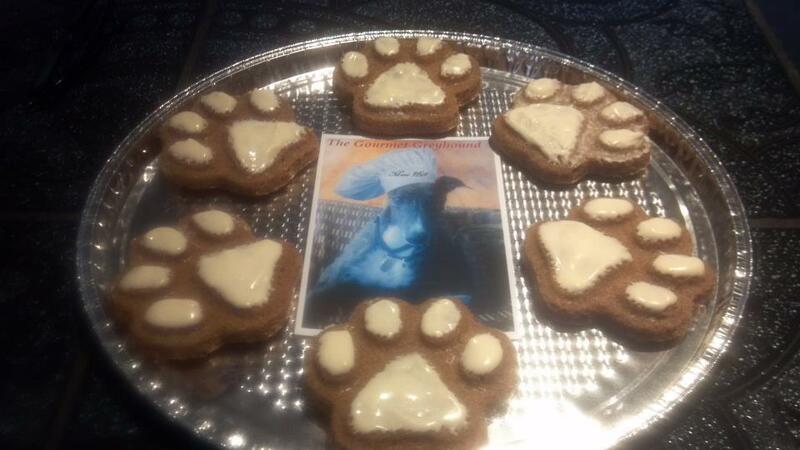 The dog birthday treats featured above were decorated with K9Cakery Fido's Frosting brand dog treat icing by The Gourmet Greyhound dog bakery. Each has its pros and cons. Don't worry, we cover them all; just keep reading. By the time you finish exploring this site, you will be an expert, or as we like to say, a PhD (perfectly healthy dog) baker. Do you want the icing to dry hard? Do you live/work in a warm climate? Do you plan to ship your finished treats? Do you need an icing that does not require refrigeration? Do you want to limit the amount of fat and sugar? The best dog icing choice for professional looking dog treats that look like they came from a dog bakery is Magifrost dog treat icing, the Fido's Frosting brand made by K9Cakery. It not only dries hard and will not melt in the heat, but will not need refrigeration. It will remain intact through the shipping process. Shelf-life is long. You can package your dog treats and ship them anywhere at any time of year without worry about the recipient opening a package of gooey, melted treats. Use icing powders for spreading, dipping, coating, drizzling and piping. These are the best choice for making intricate designs or for writing words. One final word. You probably will not like the taste of the icing, but your dog will. Please don't use your own taste buds to judge what your dog will or will not like. Dogs use their heightened sense of smell to judge if they want to eat something. They don't need to have the sugary, sweet taste that humans enjoy in order to devour a food product. Coating chips are loaded with sugar and fat. They appear to dry hard, but if the treats are left in a warm place, or shipped in a warm truck, the "icing" will melt into a gooey mess. When the dog bites into these candy coated treats, the candy will start to "melt" and get all over the dog's mouth and/or your carpet. The next time you are in a pet store, browse through the dog treats on sale. Take a look at the packaging. If the icing is sticking to the wrapping, chances are high that the bakery used coating chips or candy chips. The treats were likely shipped in a hot truck or stored somewhere with a warm temperature. These treats do not make a pretty presentation, do they.. The secret they don't want you to know..."yogurt chips"
Candy chips are easy to use. All the baker has to do is heat them up and melt them. Then when they dry, it looks like it's a hard coating. As soon as you leave the treats in your warm car, the icing starts to melt. That's because the fat in the candy is starting to heat up. When it heats up it melts. Yogurt chips are mainly hydrogenated fat and sugar. There may be a little yogurt in them. Bakery items are advertised as being decorated with yogurt icing, however, the truth is that they are mainly fat and sugar and maybe there's a little yogurt. They can't tell you that because you would never buy the product! They are allowed to claim that they are using "yogurt chips because there is likely a small amount of yogurt in the ingredients. You will see this in the ingredient list. The main ingredients are fat and sugar.